Work it out – finding what works for YOU! Part of the battle towards weight loss and healthy living is finding time to work out. Between family time, working full time, campaigning (I work in politics), running errands, and “life” it can be hard to find time to work out. I’ve played around with evening work outs…morning workouts…weekend work outs…and everything in between. At the end of the day you just need to find what works for YOU. Morning workouts mean waking up at 6 am versus 7 am and splashing my face with water to wake me up. I have runner friends who wake up at 4 or 5 am for their morning runs so 6 am seems just fine! I lay out my clothes the night before so that all I have to do is put them on, grab my already prepared water bottle, and head out the door. With a gym in our apartment I have no excuse! I think it actually makes me more of a morning person because by the time I finish up the husband is awake and it’s time to make breakfast before work! But is it hard to workout without an food to fuel you? Not really. Water is enough for me to get through my morning workout and your body is burning the food you are the night before. I find that if I eat in the morning before a work out I get sick! A bottle of Nuun gets me through my morning work out just fine. So play around with your schedule and see what works for you! 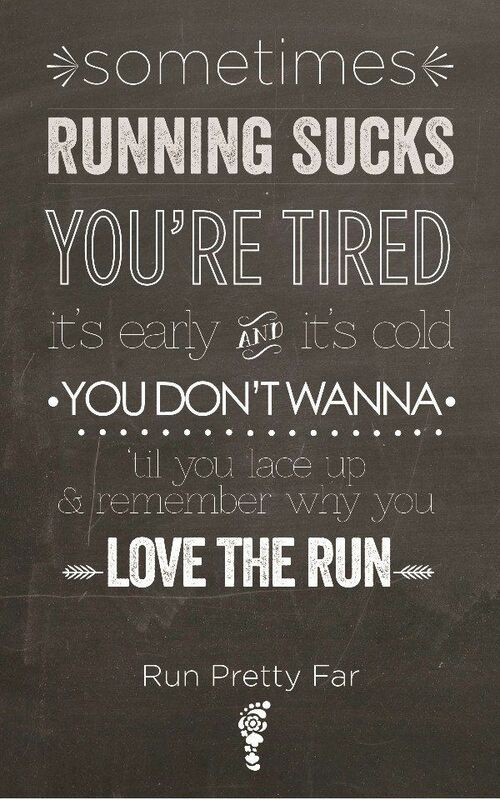 Remember, in the time you spent “thinking” about running, you could have finished your run! Everyone had 30 minutes to get a run in on any given day (even if it means MAKING time). Work out early in the morning before you get ready for work. It means getting up 40 minutes earlier and it is worth it. Work out at night after work and before you have dinner. I promise you that your dinner will (1) taste better and (2) you;ll make wiser food choices. Work out on your lunch break at work. We are all busy people but mentally you still need to take a break from your computer screen for 30 minutes. Use it to go on a walk or run. Look for things in your like that you can cut out in order to fit a work out in (that hour you spend on the computer/TV after work, Happy Hour with friends/coworkers, etc.). Have any other tips for fellow runners? Share them below! I’d love to hear about them! I love to run in the morning! It’s cooler (especially during these hot, muggy, Maryland days), I feel energized for the rest of the day, and I can go through my day without the anxiety of knowing I still have to cram a workout in somewhere. I like to eat a PowerBar or have a protein shake a little before I head out just to give me some fuel for the run and then I make breakfast when I get back. A PowerBar is probably a good option – Max and I need to look into that! Do you have a protein shake you like?? I need tips on new brands, haven’t found anything I love yet. So far I’ve only tried the chocolate Shakeology by Team Beachbody (the same people who made P90X and Insanity). Stephen showed me how to make a shake with a scoop of that, a banana, ice, some milk, a scoop of peanut butter, and a little bit of cinnamon and vanilla extract. It was soooo good and it didn’t feel heavy. I only drank about half that I made before my six mile run on Saturday. I realized after I tossed the rest down the sink that I could have saved it for post-run. Live and learn! Haha, mostly because that stuff is expensive! I want to try Team Vega’s products but have not caved to spend the $$ on it yet. I like your recipe thou — I will have to try that!